Douglas County Forest Products is an independently owned sawmill located in the scenic Umpqua Valley, near Roseburg, Oregon, on the I-5 corridor. Our mission statement is, simply, A Commitment to Quality. We’re not big, and we don’t have extravagant offices. However, we do have a state-of-the-art sawmill, commitment to quality, and hard working employees dedicated to getting the job done right. 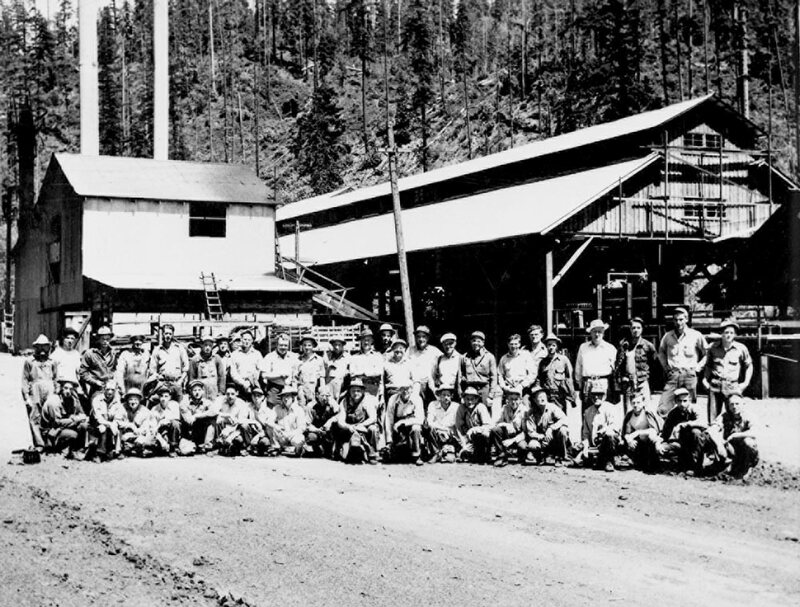 Douglas County Lumber Company, now Douglas County Forest Products, was established in 1941 east of Roseburg with the blood and sweat of a small logging crew led by timber pioneers Sid Comfort and Maurice Hallmark. The original Mill located at Rock Creek. The original sawmill, five miles up Rock Creek, was diesel powered, and the company did its own logging on federal and private old-growth timberlands. The rough dimension lumber was shipped to Roseburg and taken by railcar to Coos Bay for remanufacturing. On average, the mill produced about 20,000 board feet a day. A few years later, the mill was converted to steam power, and production was increased to 60,000 board feet a day. Efficiency bred profit and growth, and soon Douglas County Lumber Company looked like a small town in the middle of the woods. By the early 1950s, the company employed about 100 men, who were housed in bunks and cabins and fed three hearty meals a day by camp cook Molly Morgan. It was common for Sid and Hallmark, as their employees called them, to dine with the crew, especially when Molly’s liver and onions and black-eyed peas were on the table. Around the same time, the company acquired 10 acres in Roseburg, where Lithia Ford stands today. There they built a planer and produced vertical grain flooring, crossarms and dimension lumber. However, dust, soot and smoke, which poured from the burners daily, caused the community to be in constant uproar. 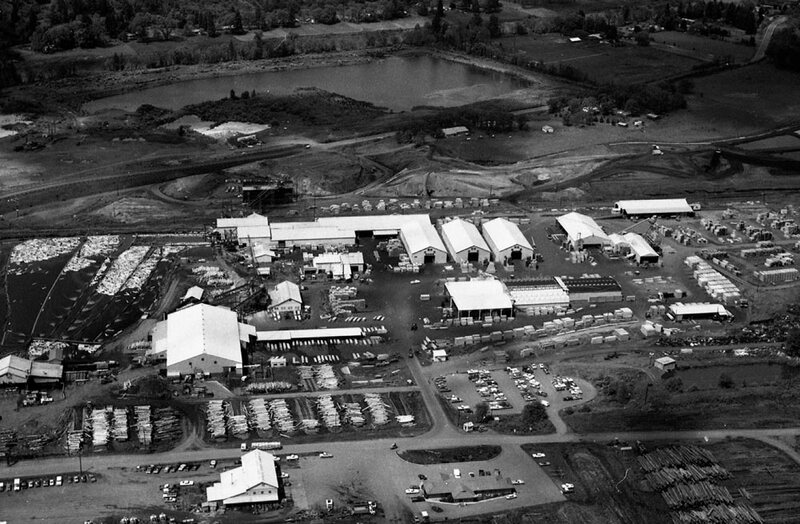 So in 1956, Comfort and Hallmark purchased the Winchester property, five miles north of Roseburg on Interstate 5, and consolidated the company to one location. Douglas County Lumber Company struggled during the late 1950s and early 1960s, but Comfort and Hallmark didn’t give in. It is said they felt they had an obligation to keep their people working. After many late-night meetings, they decided to evolve. They built a veneer plant and core mill, which is said to have saved the company. Comfort, Hallmark and their dedicated crew rode the timber industry highs through the 1970s, but a nation-wide recession in the early ’80s hit the timber industry hard. Hallmark retired in 1983 for health reasons, but Comfort insisted on trying to salvage the company. However, the high cost of timber, bad markets and labor problems forced Comfort to close the mill in 1985. He was 78 years old. Like Comfort and Hallmark in the 1960s, Westbrook and Bruce also chose to evolve the company. They changed the name to Douglas County Forest Products and became a spot lumber producer for the Japanese and European markets. When the foreign markets crashed in the mid 1990s, they evolved again. They revamped the mill and switched over to stud production, which is what the mill thrives on today.Bruce succumbed to cancer in 2002, and Westbrook turned to two new partners – Rick Mathews and John Blodgett – for help and growth. Currently, Douglas County Forest Products employs 160 people and produces 225 million board feet of lumber annually. The current plant is a model of efficiency and productivity. Every log that goes through the mill is fully utilized, whether it is a unit of high quality studs, chips, sawdust, hog fuel, or shavings. The company is still privately owned by Westbrook, Mathews, and Blodgett. The owners and operators of Douglas County Forest Products plan on evolving for many more years to come.